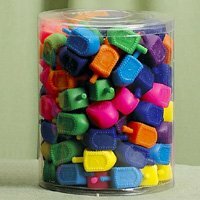 Medium Plastic Dreidels - New 100 Pack of colorful Draydels. A convenient new size perfect for teachers or your child's class. 1 3/4" tall. New! 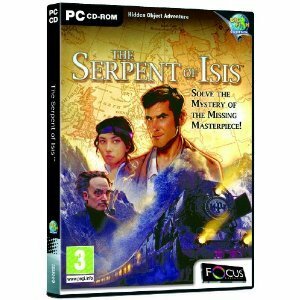 now with english transliteration of the Hebrew letters. 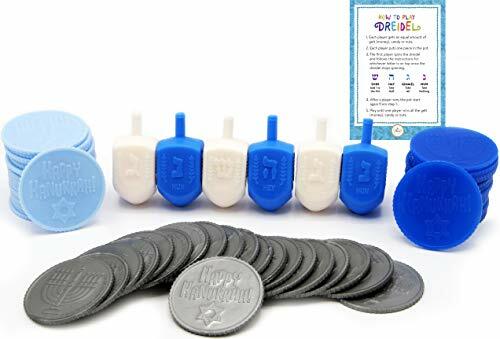 Get the kids into the Hanukkah spirit with the Draydel Game. You will enjoy playing this classic game with colorful plastic draydels. Hanukkah, also spelled Chanukah and widely known as the festival of lights, is for many one of the liveliest Jewish holidays. Hanukkah tells the story of the Greek who ruled over the Hebrews and persecuted them to the point that they were not allowed to practice the Torah. The Jews prevailed and turned this situation around in a defeat against the Greeks. The miracle of the oil took place and the rest is history. 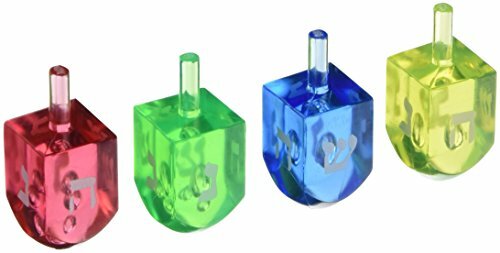 Dreidel Favors come in a 4 pack of Orange, Blue, Yellow and Green and they are 1 3/4" x 3/4" inches each. 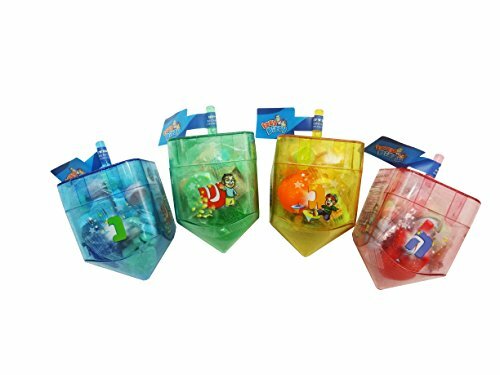 Each one of your guest will have so much fun spinning these Dreidels and after wards can be filled with some sweet treat or even Hanukkah Gelt!. 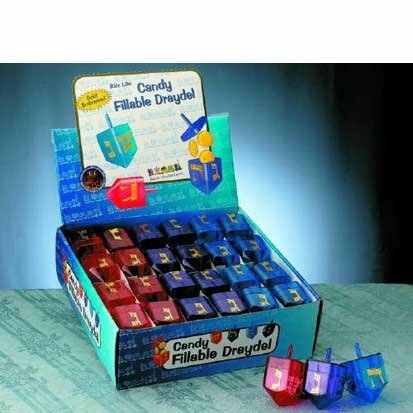 Creative Chanukah SuppliesGet your budding artist's creative juices flowing with Izzy 'n' Dizzy's wide array of Chanukah toys, games, arts and crafts, party supplies and stationary. The large selection ensures there is something for everyone - for boys and girls, and for toddlers or children.Fun and EducationalBring the holiday of Chanukah to life with exciting activities that are as much fun as they are educational about the holiday. Let your child create their own holiday paraphernalia, decorate their own party supplies, or simply spin a dreidel or play a fun Chanukah game, all the while discovering and experiencing the holiday's traditions.High Quality & Safe All Izzy 'N' Dizzy products are made with premium quality materials, and are completely safe for play and use. 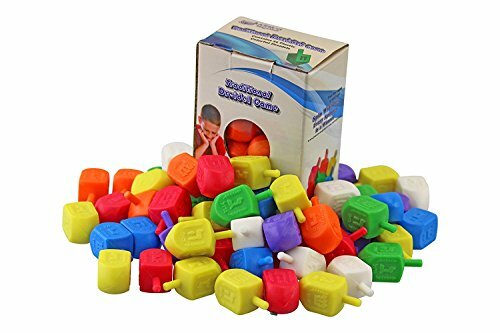 Perfect Present For EveryoneThese games and craft kits will keep kids occupied and busy while you attend to other things and get them excited about their Jewish holiday traditions. They can color, decorate and make things their own.These are perfect for Chanukah presents and gifts, or for party favors and party goody bags. 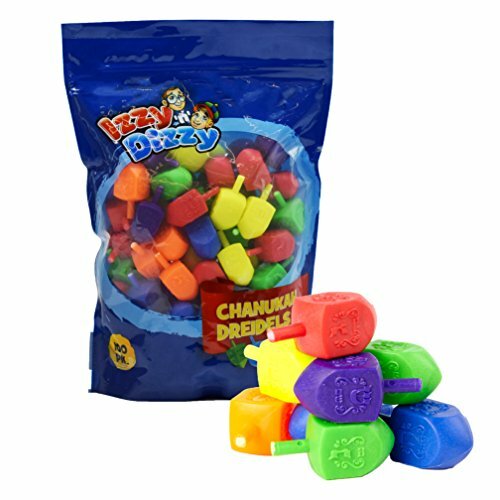 Keep some one hand for prizes and rewards, or to keep children entertained at your Chanukah party.Whatever your children's Chanukah needs, Izzy 'N' Dizzy has got you covered! 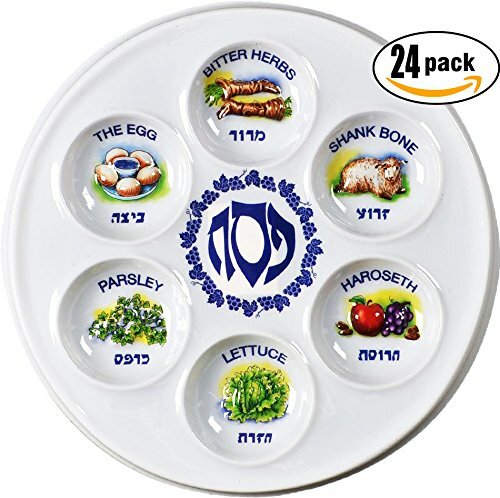 Add a special touch to your Hanukkah party favors. 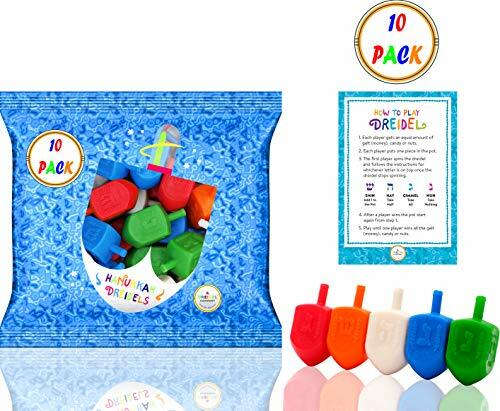 Each plastic dreidel can be filled with treats or small toys. Allow us to choose your color. 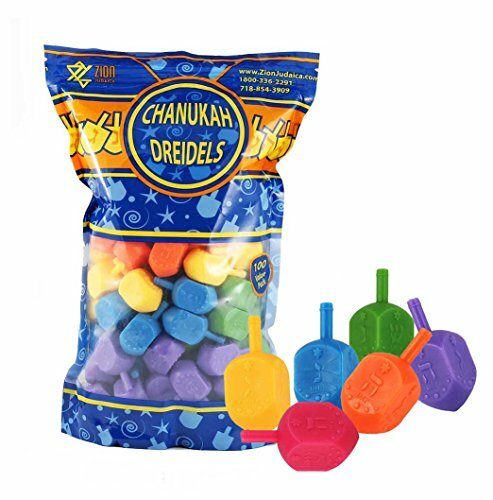 Grab a bag of these colorful dreidels. They are great spinners and a in a very handy size. 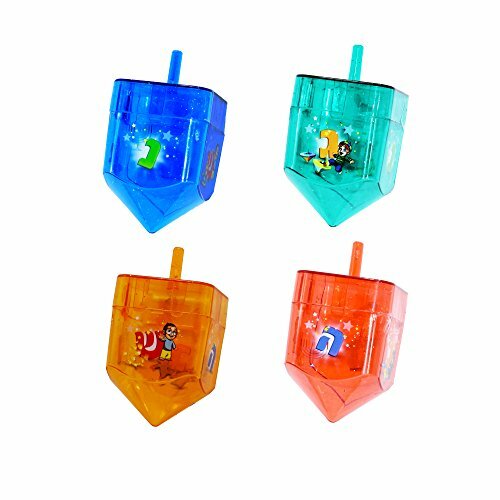 Bring some extra light to the Chanuka/Hanukah holiday with these bright colored Dreidels! 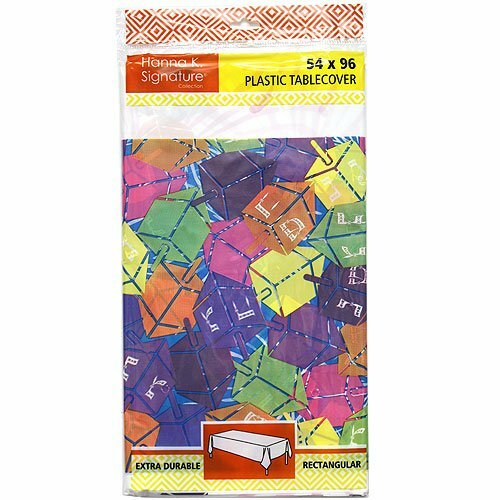 Hannah K. Signature Dreidel Pattern, 54" X 96" Inch Plastic Rectangle Table cover, 1 Per Package. Extra Strong. Heavyweight plastic. Designed for Chanukah occasions, banquets, parties, upscale catering and home. What's a dreidel? Elmo wants to know! He finds out as he celebrates the first night of Hanukkah with a friend's family. This sturdy board book introduces little ones to a few of the traditions of the Jewish Festival of Lights. Full color. This stunning pewter ornament embellished with high quality Matashi crystals, is crafted with pewter and hand-painted with a vintage demure style that’s beautifully classic.A 2-in-1 design, this small bronze and gold spinning dreidel with the traditional hebrew letters, can be used as a toy or hung up as a holiday decoration to represent your Judaism faith.The bottom of each metal dreidel features a dull yet easy-spinning point that’s safe on surfaces and great for kids and adults alike.Every dreidel comes with a high-quality storage gift box, perfect for celebrating the season or as one of many Hanukkah gifts! A beloved grandmother spreads out a yummy Hanukkah supper only to develop an insatiable appetite that alarms her family, in a story augmented by parodies of art by such masters as da Vinci, Rembrandt, and Picasso. This is a 4.5" Noble Gems Hanukkah Dreidel Glass Ornament. Part of Kurt Adler's Fabriché' collection, this 11" Fabriché Santa Holding Dreidel is a fun and festive addition to any holiday décor. Perfect for interfaith families, Santa Claus is featured here wearing a white and blue tallit and holding a dreidel. Playful cats encourage the reader to count to eight to celebrate Hanukkah. The dreidel is a small four-sided spinning top with a Hewbrew letter on each side. The beloved toy is played with during Hanukkah. On each side of the dreidel is a Hebrew letter, together forming the phrase, a great miracle happened there, referring to the miracle in the Land of Israel. It's Hanukkah, and Baby wants to spin the dreidel, but where is it? Lift the flaps to find sparkly foil Hanukkah gifts, and join Baby in this hide-and-seek adventure. The itsy bitsy dreidel gets ready to celebrate the Festival of Lights with the lighting of the menorah in this fun and playful Chanukah twist on the popular nursery rhyme "The Itsy Bitsy Spider." Full color. 5 1/2 x 5 1/2. Die-cut in the shape of a dreidel, a sturdy sing-along celebration of the classic Hanukkah tradition features endearing animal families who light the menorah, fry latkes and spin the dreidel together. 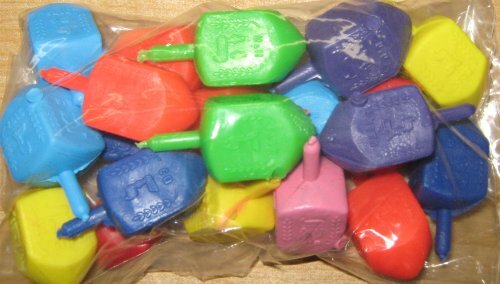 Multi Color Plastic Dreidels. See how they spin. Mobile and computer secure online ordering http://www.chocolategelt.com/catalog/plastic-dreidels-p-40.html Quality. Value. Chutzpah. 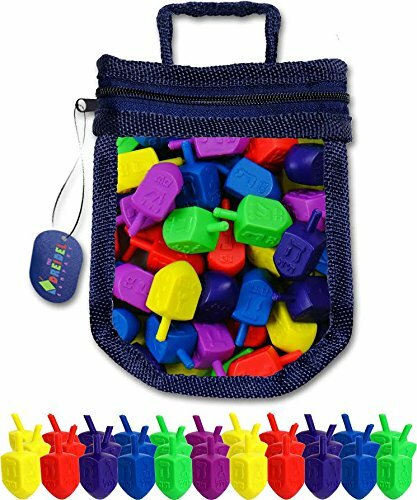 Looking for more Plastic Dreidel similar ideas? Try to explore these searches: Tank Locomotive, Voile Switchback Binding, and Button Up Cashmere Cardigan. BlesDeal.com is the smartest way for online shopping: compare prices of leading online stores for best Plastic Dreidel gift ideas, Plastic Dreidel deals, and popular accessories. Don't miss TOP deals updated daily.